As a premier supplier of timber products Interlink takes the associated environmental responsibility very seriously, and will only source products from sustainable or recycled locations. Interlink operates online and via the phone to reduce costs by removing retail elements. These savings are then passed on to the customer so we can supply our product at 20-25% lower than the market retail rate. **Terms and conditions: Prices are GST exclusive, minimum orders may apply. Products may slightly differ from images. We refund or replace if deemed unsuitable for landscape use. Interlinks comments/notes: A product that has only just begun its life, incredulous durability. Fantastic for continuity on larger projects with strong supply ability. Fantastic to utilize with other new products & designs. Ideal for incorporating various building materials (raw & manmade). Provides a clean & seamless transition between settings & designs such as new house builds to existing landscaped surrounds. ---African Azobe railway sleepers, for example, are often used untreated by British Waterways under water, due to their natural preservative qualities. Jarra, Karri, Mora, and Greenheart are likewise placed untreated on the railway track by Network Rail, and are expected to last for up to 100 years. ----So, untreated railway sleepers are popular with those wanting to keep clear of chemical treatments, or contamination, and wanting to use something that is naturally very long lasting. An original used Australian hardwood railway sleeper. Not treated with any preservation chemicals due to the natural durability of the Australian hardwoods. •About: The NZ sleeper is the best and most cost effective 'used sleeper' available on the market for all kinds of uses from edging to retaining walls to posts. A naturally fitting product that will noticeably blend in to existing surroundings or offer a prominent weathered look against newer, man-made products. •Using product: Cut, handled and modified easily, with durability up to 25 years. Can fit together with minimal fixing. Ready to be placed & used immediately. Interlinks comments/ notes: Authentic weathering in texture. Surface will adapt to environment. Not suitable for vegetable gardens as chemically treated. (polythene lining recommended). Great for retaining walls, garden edging, vertical installation. Facts/ myth debunking: The idea of a main trunk railway between Auckland and Wellington had been talked about since the 1860s, but during the Vogel era of the 1870s rail-building efforts were focused elsewhere in the colony. By 1880, Auckland's southern line reached as far as Te Awamutu, and isolated sections had been built in Taranaki, Manawatū, Hawke's Bay, and between Wellington and Wairarapa. Between southern Waikato and Manawatū lay thousands of hectares of rugged country, volcanic mountains, deep ravines, dense forests and Māori land. On 15 April 1885 Premier Robert Stout, Wahanui Huatare and Rewi Maniapoto ceremonially turned the ‘first sod' of the central section at Pūniu, near Te Awamutu. Despite high hopes, it would take another 23 years of exploration and surveying, parliamentary enquiries, and sheer hard work to complete the main trunk. Fast track to today, the network is now in the best condition it has been in for a number of years following more than $549.3 million in network upgrades and improvements. It is these upgrades & improvements that now allow us to re-gift life back to these historically rich railway sleepers. NZ sleepers are the most cost effective sleeper for their size and ability to lift cut and modify easily. The preservation treatment is to H5, near to marine grade requirements and so durability is assured. This high rating of H5 makes the NZ sleeper not suitable for seats or set in concrete as partitions for your concrete expansion allowance, unless out of the sun as the preservation treatment has been reported to come to the surface in very hot summer conditions. Around vegetable use polythene or a hardwood sleeper. However for all other uses particularly in semi-rural or large garden designs these are the best sleeper to use on any such projects due to their ease of handling and versatile uses with durability assured. They have been given a second life after being a wharf for a few decades. Perfect your timeless rustic landscape or construction design. About: These are big Hardwood timbers made up of jarrah, ironbark and other royal Australian hardwood species brought into NZ 30 to 50 years ago. The big and impressive factor is what also hinders the supply ability as new timber is to cost effective to mill at these dimension any more, with laminated timber and steel ‘I’ beams etc taking their place. Further the old trees that can provide 400 x 400 dimension heart quality timber are either protected (hopefully) or non existent in the approved logging areas of Australia. Their lives as wharf structures, bridge bearers or railway structures are over but they are available in rustic form to offer a second life. Interlinks comments / notes: Traditional rustic sleeper with A - grade qualities that can be well utilized in any setting. Facts/ myth debunking: In 2012 New Zealand First MP Brendan Horan was calling for heads to roll at KiwiRail, despite the state-owned company saying it is responding responsibly to the discovery of a batch of rotting railway sleepers. Kiwirail Chief Executive Jim Quinn responded with a commission of independent DNA testing. "Test results just received by us on a consignment of sleepers contained at one of our workshops indicated that two of the fungus types are new to New Zealand. Testing confirmed that these pose no danger to humans and the Ministry of Primary Industries (MPI) is currently investigating whether the fungus poses any biosecurity risk.However, we are now taking extra steps as recommended by MPI to sanitize and contain the sleepers we are systematically removing from the network." "Until we have resolved a disposal strategy with MPI we will be applying a household bleach solution to the sleepers as they are removed from the network and then keep them covered as we transport and store them." "The results of the testing that found potentially unwanted fungus types only relate to the consignment of sleepers that are being held at our workshop. The initial testing we commissioned on sleepers on the network found they contained a fungus common to New Zealand.Despite this we are implementing a no-risk approach. Even if it turns out the sleepers we are removing don't contain the unwanted fungus type, the extra measures we are taking are a responsible move." Description: A - grades Top and sides are generally square but worn and rustic weathering. Splits and worn ends can be present. B - grades Top and sides are generally square but can show changes in dimensions and substantial rustic weathering. Splits and worn will be present However the rustic affect is fantastic. Facts/ myth debunking: Not all sleepers are naturally durable, in fact most are creosote treated and certainly anything from the USA has chemical applications applied. Australian hardwoods are the only railway sleepers commercially manufactured that don’t require chemical preservation, du e to their natural durability. Dense, tight grained, hardwood railway sleepers, especially tropical timbers, are completely different to light, softwood railway sleepers which have to be treated with either creosote or pressure treatment to prevent them rotting and collapsing. Hardwood railway sleepers are much more durable and naturally longer lasting. African Azobe railway sleepers, for example, are often used untreated by British Waterways under water, due to their natural preservative qualities. Jarra, Karri, Mora, and Greenheart are likewise placed untreated on the railway track by Network Rail, and are expected to last for up to 100 years. Modernised concrete and composite plastic sleepers being used on Australian railway networks the hardwood sleepers are becoming more and more rare and difficult to secure. If we have them now, then plan ahead and get your project well thought out and secure your rare & unique hardwoods today. The enjoyment and warmth that old timbers bring to a setting is quite unique...a resounding depth of stability and quality. 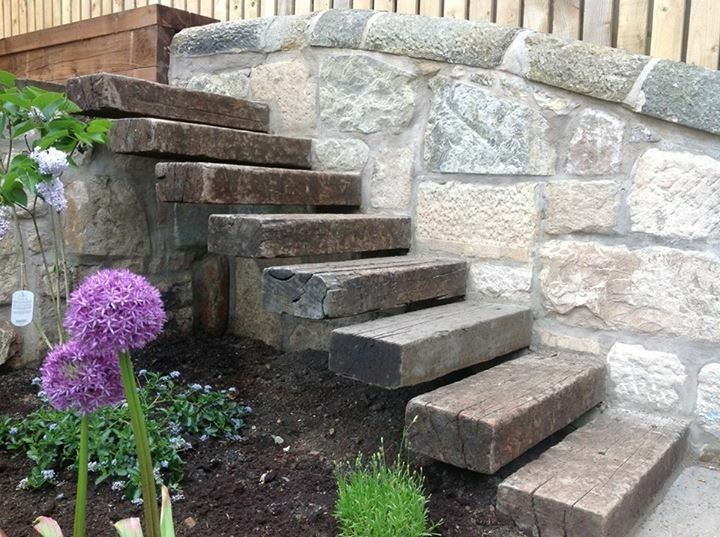 Untreated railway sleepers are popular with those wanting to keep clear of chemical treatments, or contamination, and wanting to use something that is naturally very long lasting. Description: A - grade: Top and sides are generally square but worn and rustic weathering. Splits and worn ends can be present. B - grade: Top and sides are generally square but can show changes in dimensions and substantial rustic weathering. Splits and wear will be present however the rustic affect is fantastic. Delivery & logistics: Bundle of 16 = 1120 kg / 1.1M3 - minimum tandem trailer with adequate tow bar rating is advisable, commercial light to heavy truck is ideal. "The enjoyment and warmth that old timbers bring to a setting is quite unique, it is not settle and glass but instead a resounding depth of stability and quality." Facts/ myth debunking: Europe has an authentic appeal and its locally produced products have an air of quality. Railway sleepers may not be high end fashion, however the engineers and timber sawmillers do have strict standards and this is reflected in the longevity of the sleepers and the better quality that comes out of Europe. Likely due to the colder temperatures slow a trees growth and hence the timber growth rings are tighter , making a far more solid and dense timber that last the test of time and are still well intact to grade as A to AA quality. Equally the Europeans do not fell vast areas of forests but selectively harvest their forest.. In fact Europe as more forests now than 100 years ago ” 100 years ago, timber was used for almost everything: as fuel wood, for metal production, furniture, house construction. Hence, at around 1900 there was hardly any forest areas left in Europe. Especially after World War II, many countries started massive afforestation programs which are still running today,” ( The Washington Pos.) A little step towards helping sustain the timbers of Europe. ---These AA grade sleepers are originally from Africa milled from the beginning of European railway s up until the 1970’s railway sleepers, they have also been used on British Waterways under water, due to their natural preservative qualities. Jarra, Karri, Mora, and Greenheart are likewise placed untreated on the railway track by Network Rail, and are expected to last for up to 100 years. ----So, untreated railway sleepers are popular with those wanting to keep clear of chemical treatments, or contamination, and wanting to use something that is naturally very long lasting. And these AA gardes are the best that can be found in a used and rustic design.